Mouser is a Little Mouser from Mario Party Advance, and the owner of the Duel Tower. 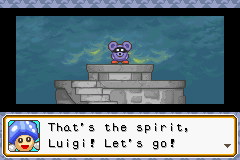 When the player first enters the tower, they are greeted by Mouser, who then asks if they know about the "duelist greeting" or not. If the correct answer is given ("Chaaaaarge! "), then the Duel Tower quest starts. As the player treks the first fight with Whomp and the second floor with Salvo, Mouser appears between stages to cheer the player on. On the third, Mouser himself is fought. Once he is beaten, he says that only the player can stop Bowser from conquering the world and lets the player keep the tower minigames. Mouser's in-game description says that he "even battled it out with Bowser!" French Arato Pun on "rat"
This page was last edited on September 30, 2018, at 17:58.